MARIGOLD PEEL FRESH, a beverage brand of Malaysia Dairy Industries, has partnered Singapore-based digital creative agency, noisycrayons, to launch a Lunar New Year campaign on social. The maker of the popular PEEL FRESH brand of juices aspires to reach Singaporeans who will be looking to stock up their homes with festive goodies for visiting guests during the festive period. This represents an attempt to reach out to the busy Singaporean who spends a significant amount of time hard at work. Whatever time he is left with is usually spent commuting and socialising with loved ones and family. With the Singaporean lifestyle defined, the campaign is to reach more than 4.9 million Singapore users of mobile devices who spend an average 1.6 hours a day on social media. It is, therefore, important that the campaign is able to capture the attention of Singaporeans on the move and provide compelling incentives for them to remain engaged as they make purchase decisions for festive products. To achieve this, the campaign is designed to instantly gratify the Singaporean in a meaningful way while he is on the move. The concept of a gigantic Tree of Abundance that stands tall in a Peel Fresh Garden bore fruit. Men and women are invited to the Garden to unveil festive surprises by shaking their mobile devices to shake the Tree of Abundance. Inviting friends and relatives to the Garden earns everyone opportunities to shake the Tree. Within 48 hours, more than a thousand Singaporeans have entered the virtual Garden and shaken the Tree of Abundance. 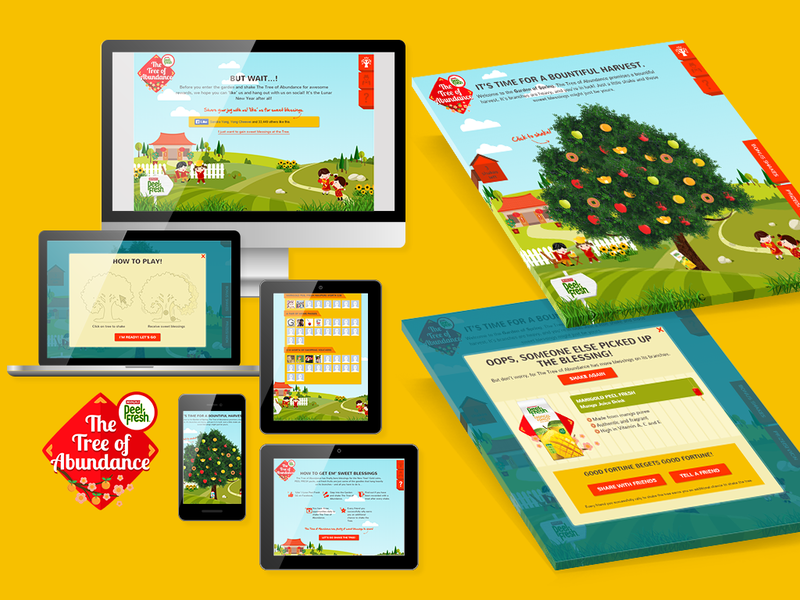 The Tree of Abundance is a Lunar New Year collaboration between MARIGOLD PEEL FRESH and SPH Magazines affiliate, noisycrayons, to forge meaningful digital relationships between the brand and her consumers.